I have been an admirer of Nervous System’s work for a while now. Their work is always amazing and avant garde, but in a way that is wearable. This new line, Cell Cycle, is no exception – the jewelry is bold, yet simple – but the story and theory behind them is art in its own right. 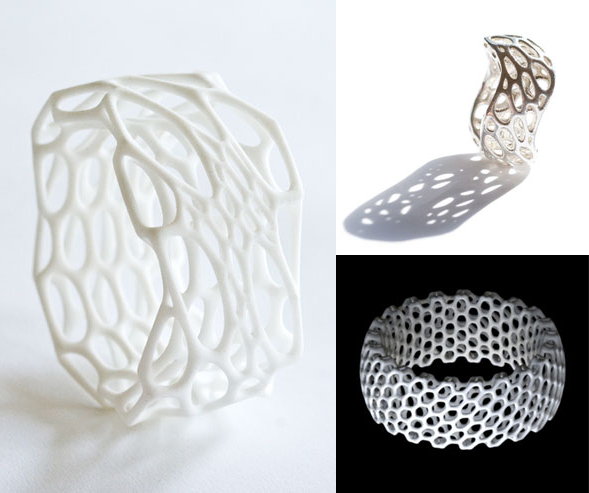 Inspired by “the complex forms of radiolarians” and made with “Selective Laser Sintering, a kind of 3D printing” Nervous System successfully connects art and science. As an added touch, you are able to experiment with, and order, your own jewelry designed with interactive applets on the website. I saw this designer at the Renegade Craft Fair in Williamsburg and was dying. I LOVE her pieces.